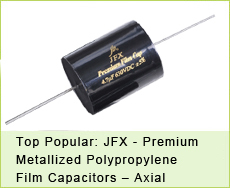 JFJ Series is constructed of metallized polyester film (stacked technology) with radial leads of tinned wire. Radial leads are electrically welded to the contact metal layer on the ends of the capacitor winding. 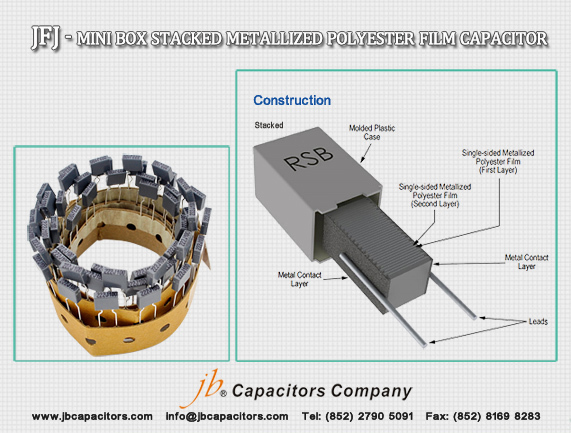 The capacitor is encapsulated with thermosetting resin in a box of material meeting the UL 94V–0 requirements. Typical applications include high performance, high temperature, blocking, coupling, decoupling for a signal from DC to high frequency, pulse, logic and timing circuit, lamp capacitor for electronic compact lamps, inverter for LCD monitors, automotive DC motor suppression. Voltage range 50 – 630 VDC , Capacitance range: 0.001 – 1.0 µF, Lead spacing: 5 mm, Capacitance tolerance: ±20%, ±10% standard, ±5% on request.RoHS Compliant and lead-free terminations,Tape and reel packaging. Hi, please kindly to notice that our workers will have Chinese spring festival holiday (on Dec.30th ~ Feb.14th), but our jb sales team will still work during holiday, when you have any urgent capacitor request/ orders, welcome to contact us at once, we'll give you a fast reply as usual. Thank you. Happy chinese new year to you! 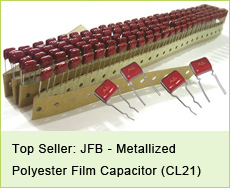 In year 2015, jb Capacitors added below Strong Products to our production line. We wish to give you best support in year 2016. Let us work together to make more business chance. If you need to know more detailed information, please check below link for reference. Welcome to send me your request! 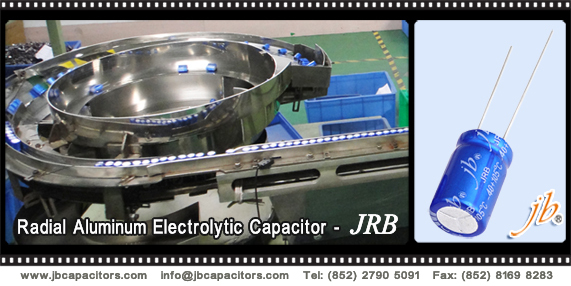 We would like to share the most common Radial Aluminum Electrolytic to our customers. Please find below table for reference. 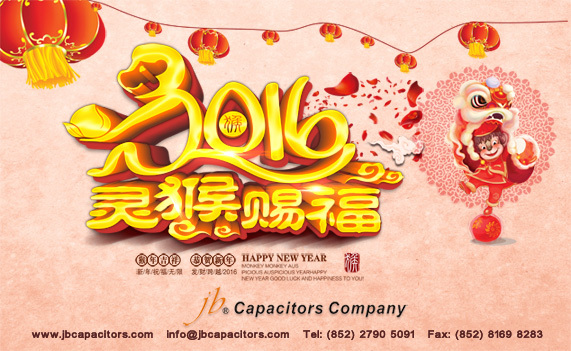 jb Capacitors Company--Prosperous in 2016! Happy New Year! Welcome back to work! Did you have a nice & unforgettable holiday? 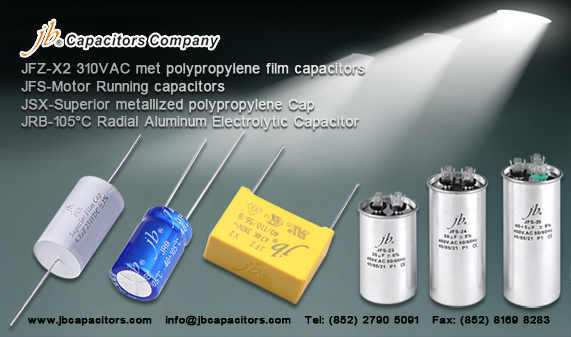 We are expecting your new capacitors inquiries & order as an auspicious start of 2016! Feb. 7th 2016 is Chinese new year, while we are openly to accept your orders at anytime! If you need a good delivery date, we prefer to receiving your earlier inquiries/orders for prior production flow arrangement. 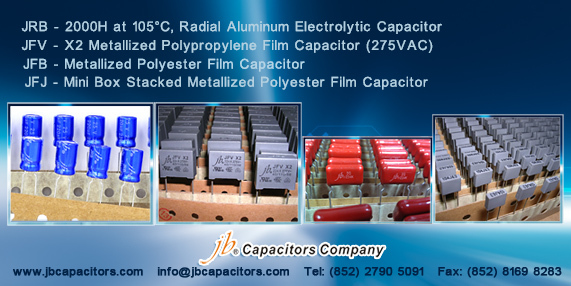 jb Capacitors Company produces 12 standard types CBB60 Motor run capacitors. JFS-10~JFS-21 with CE and UL certificates. 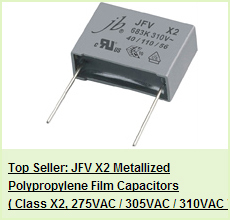 Capacitance 0.5uF~120uF, Voltage 250VAC, 450VAC. (Special items upon request). If you only request 100pcs or less than 100pcs, we could offer average 300pcs MOQ for mixed items, quite flexible! High quality you can be assured, samples are available for your test upon request. We would like invite you to visit our factory from below links and know more about Motor Capacitors Laser Marking Process. This is very funny and an advance technology. 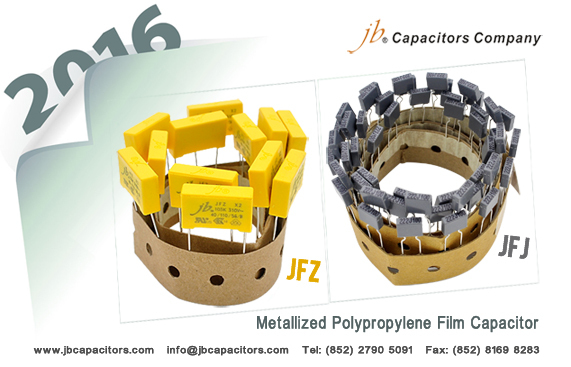 jb Capacitors wish You Happy New Year! Here I want to share you a good news, now, we have below stock on hand, do you have interest? the stock have justbeen prepared, then I email you. but as the quantity is limited, first come, first served. Address: New Munich Trade Fair Centre, Germany.